Another Beautiful Day in Paradise. We had a lovely blue ski with a few clouds, temperatures in the high 60s and a gentle - gentle breeze. 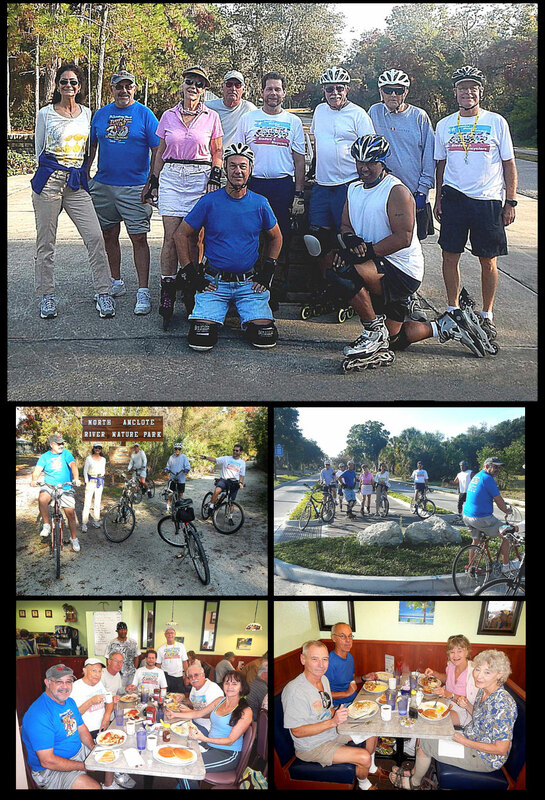 Bladers/bicyclers Theresa V, Rob H, Glennis W, Roy H, Dimitri F, Dee T, Steve G, Bruce M, Jeff B, Breeze and Iara B came. Iara missed the picture. We decided not to do Wall Springs Park but head North. We did the North spur trail near Hwy 19 and took a spur off the spur trail and ended up at the North Anclote River Nature Park. It was a nice little park off Dixie Hwy. We got split up into two groups as the bladers didn't go to the Nature Park as it had a gravel road. The bicyclers did 11+ miles and the bladers did about the same. We had 4 bladers and 8 bicyclers. Carlos renewed his Sponsorship last week and today we had Dee & Sam T, Rob H and Roy H renew their Sponsorships Thanks Carlos, Dee, Sam, Rob and Roy for the website support. Yes 2015 Sponsorships are now due. Present 2014 members will still receive email through January 2015. Breeze is now the webmaster for the Sunday Bladers. Welcome Breeze and thanks to Tyler for his years of dedicated and excellent website management. We Brunched at the Chatterbox North at my suggestion. Dimitri went ahead and made a reservation for us so we got right in and seated. Thanks Dimitri. Bill, Diane and Iara joined us for Brunch but we lost Theresa somehow. Service was good and the coffee flowed freely. We had a range of ratings from 9.3 to 9.7 so we'll give the Chatterbox North a 9.5.